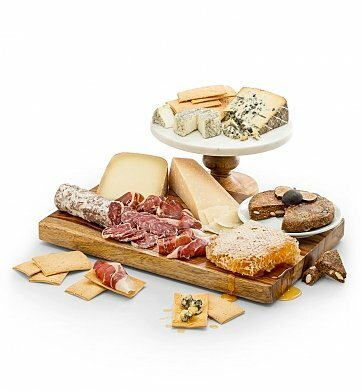 From raw honeycomb to French goat's milk cheese to the best ham in the world, this gift has everything you need to make your dear ones feel like royalty. Each artisanal cheese is cut-to-order by world-renowned Murray's cheese makers, gently wrapped in specialty paper and shipped with ice packs to preserve its perfectly cool condition. Presented in a rustic wooden crate, it's a gracious offering for those with excellent taste. Bonne Bouche Aged Goat Cheese. Epoisses Soft Cow's Milk Cheese. Sola di Bruna Parmigiano Reggiano. Moliterno al Tartufo, an Italian cheese with truffles. Contains 1.75 pounds of cheese and 8 ounces of meat. if ordered by 5:00 am EDT Wednesday April 24th. Black Tie Cheese Tasting Event is a hand delivered gift. These gifts are delivered by one of our local design centers located throughout the United States and Canada. Same day delivery is available for most gifts when ordered before the cutoff time. The cutoff time for Black Tie Cheese Tasting Event is 2 AM in the recipient's time zone. Send a lavish tasting menu to the comfort of home with this critically-acclaimed collection. Gift contains gel ice packs to safeguard the shipping process.